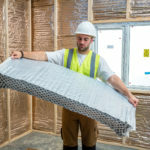 The chancellor’s announcement of an extra £500m boost for the Housing Infrastructure Fund has been welcomed by insulation specialist Actis – but the housebuilding industry must have the capacity to actually produce the homes to populate the burgeoning new developments. That’s the message from pan European insulation specialist Actis, a staunch supporter of the quick-to-build offsite home. Timber framed properties can be built around 30% more quickly than their traditional counterparts – and many of the tasks taking place in the factory can be carried out by less skilled workers – an ideal solution at a time of housing crisis combined with a lack of construction artisans. Many of the services, including insulation, are installed off site, unhampered by the vagaries of the weather, making the on site build out process a relative straightforward affair. Large scale construction of offsite homes has indeed been championed by London Mayor Sadiq Khan, and Mark Farmer, author of the government commissioned Farmer Review of the Construction Labour Model, which calls on the sector to ‘modernise or die’. Actis national specification manager Dan Anson-Hart said, while increasing the Housing Infrastructure Fund to £5.5 bn was obviously good news, there was no point in creating the new roads, schools, flood defences and green corridors it was set up to pay for if the 650,000 houses they were designed to support were not forthcoming. “Obviously it’s great that the extra money will enable local authorities to unlock land for housing where it’s most needed. But in order to build the number of homes this will facilitate we need to rethink our approach to physically delivering those homes. Otherwise we may end up with goodness knows how many roads to nowhere!